Detect termites on your property, before its too late! 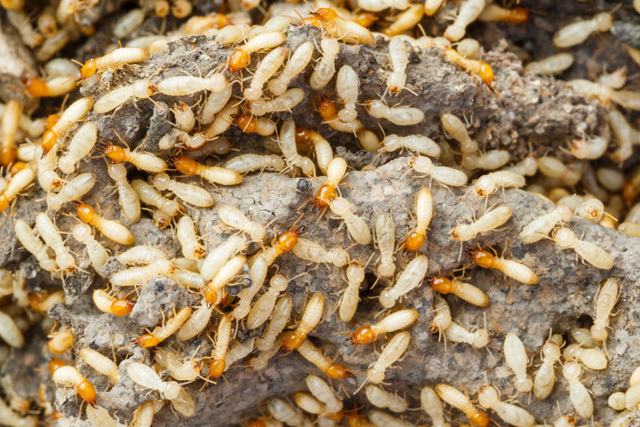 Termites can be a damaging and costly pest to have invade your property. These invaders eat up our trees, our furniture and wooden fittings, and even our homes and buildings. Termites feed on wood, which means on your property they will feed on furniture, fittings, and even structural sections of the building itself, causing thousands of Rupees worth of damage and in severe cases leaving your property irreparable. Termites live in colonies that can be made of tens of thousands, or even millions, of these wood eating machines! These insects can infiltrate your building through any space as small as 0.7mm! They work out of sight and by the time you notice the damage they are causing it is already too late - by this stage the colony has grown and they have been at work for many months already! The biggest problem with termites, is that by the time you have seen signs of their presence on your property, it may probably be too late. But Pestea has the solution! A recent investment in a revolutionary and state-of-the-art piece of digital machinery has allowed Pestea to now offer comprehensive inspections for Wood Destroying Organisms (WDOs) for business and homeowners in Seychelles. WDO inspection is a newly introduced service by PESTEA, the leading pest control & hygiene services provider in Seychelles. On completion of a comprehensive survey, a detailed report will be generated which will help the home owner evaluate the condition of their home and determine the steps to be taken, if any, to protect their investment. Damage caused by termites and other wood destroying organisms is not covered by insurance, therefore a WDO inspection is necessary for all homes to ensure that any threats can be found before too much damage is done and you lose value in your most valuable asset – your home! A WDO inspection covers a wide range of threats as, although a major problem, termites are not the only wood destroying organisms in Seychelles. Using this equipment, Pestea will be able to determine if, and too what degree, your home is infested with termites or other WDOs. Additionally, an inspection by one of our professional Pest Control Experts will also point out conducive conditions that could lead to a new termite infestation or support any existing termite populations. Typical examples are wood sliding against the soil, mulching materials, deteriorating wood etc. An inspection of the exterior of the home will be carried out and our qualified inspector will be looking for signs of termite activity - such as termite shelter tubes - as well as conditions conducive to termite and other WDO infestation, whilst an inspection of the interior of the home will cover both visual inspection as well as full use of the Termite Detection Device. The inspection will also help in detecting high moisture/humidity in the home. Too high humidity levels in your home can cause problems and even negatively affect your health. Microorganisms that thrive in humid conditions are of special concern as they cause allergies and asthmatic conditions. Such inspections can help if members of your household have allergies, are elderly or their health is compromised. Bugs and mould love humid homes and dust mites thrive in high humidity. Mould is also likely to develop more than 50% of the time if humidity levels are higher than 80%. Their spores contribute to the development of asthma in children and cause allergies. Ideally humidity level should be 40% to 60%. After the indoor/outdoor site inspection has taken place, a comprehensive report will be given to the home owner. The detailed written summary includes a standardized report developed by Pestea, which includes remediation recommendations with suggestions of treatment actions to take. We encourage you to chat to a qualified Pestea Pest Control Expert today to find out how we can help you protect your home from termites and other Wood Destroying Organisms, before it is too late! Need Help With Other Pests? Need Expert Pest Control Advice?